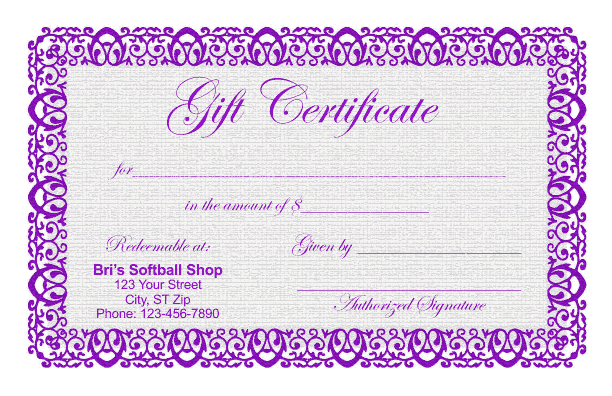 Gift certificate templates are available in Word, InDesign and Corel Draw formats. Several styles and colors to choose from. Fonts and colors can be easily edited. This template prints two up on standard 8 1/2" x 11" letter size paper, finished size of gift certificate is 5 1/2" x 8 1/2". Gift Certificates are simply a piece of paper that authorizes a person to a spend a specified amount of money in a store. This is usually purchased by another party and given to the end customer. Gift certificates are also known as gift vouchers and have been used by smart companies for many years. Certificates make the gift giving process easier for those that want to purchase a gift for an individual but have no idea what that person wants or needs. Purchasing a certificate for someone may not be as personal as choosing a specific gift but it guarantees that the person will get something that they want or need. You can create more sales for your company by offering certificates to your present customer base. This will allow your customers to actually advertise your company to others and they even pay for the privilege! It’s really simple to create a gift certificate and using our templates can be very cost effective for your company. Choose a style and color, download the version that you want and open in the program chosen. From there all you have to do is edit the information as desired and print as many as you need and cut. I prefer to keep the certificate as simple as possible and be sure to use color fo make it look better. You can also change fonts to match your business style or to match your company logo.